MILPITAS, CA--(Marketwired - Oct 1, 2013) - Elo Touch Solutions (Elo), the original inventor of touchscreen technology, today announced its 'Elo @ The Office' solutions designed to enhance communications, optimize collaboration and boost productivity in office environments. The bundles combine Elo's 42-inch to 70-inch all-in-one touchcomputing hardware with leading software to enable cloud-based collaboration, digital whiteboard, building directory and virtual receptionist applications. Elo @ The Office aligns with the new way of working through compatibility with Cisco WebEx®, Citrix GoToMeeting®, Google® Hangouts™, Microsoft® Lync®, Microsoft Skype®, ReadyTalk™ and other cloud-based applications such as QlikView® and salesforce.com®. "Once you try the Elo office solutions, you'll want large touchscreens in all your conference rooms," said Craig Witsoe, CEO of Elo Touch Solutions. "The Elo touchdisplays enhance your lobby, improve building directories and optimize collaboration while enabling cost savings. Rather than taking pictures of whiteboards or using traditional laptops with projectors, Elo @ The Office makes all your meeting rooms online, real-time and fully interactive." 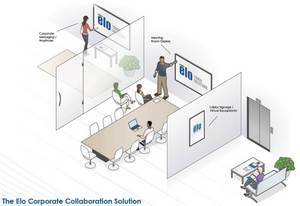 The Elo Corporate Collaboration Solution enhances the effectiveness of your multi-location meetings and integrates with your existing IT environment. The 70-inch touchscreen with integrated Intel® Core i5 computer running Microsoft Windows® mounts less than 4-inches from the wall and requires only AC power and a network connection. Elo's 70-inch touchscreen plus Hitachi's StarBoard Software combines the simplicity of a whiteboard with the power of a computer -- without the need for a projector or a laptop. Knowledge workers can capture meeting notes and integrate multi-media content to create, deliver and manage high-impact presentations with a finger or a stylus. Users can annotate over applications, write notes in digital ink, then save their work to share with others. Elo's multi-touch capabilities create opportunities for multi-user collaboration that enables teams to work together more often by accessing cloud content, presentations, digital dashboards, or other back-office applications. Elo's 55-inch touchscreen plus JibeStream® NovoTouch™ software provides built-for-touch functionality to enable visitors of any building or campus to find their destination quickly and easily. The clean and modern design of the interface makes it easy to use with directory listing templates and advanced 3D maps. Building managers can realize operational savings, streamline processes, and enhance visitor experiences with news, weather, or other customized content integration. Elo's 42-inch touchscreen plus WinTech LLC's ALICE™ receptionist software enables employees to communicate with visitors in the lobby from their desks using face-to-face video or audio-only conversations. Guests are automatically greeted and told how to use the interactive directory without losing the personal touch of human customer service. The intuitive, one-touch interface makes it easy for a receptionist in a central location to manage several remote office lobbies. Visitors no longer feel "lost" upon entering a company lobby; and employees feel more secure knowing visitors will automatically be greeted. ALICE receptionist operates 24/7 and is always available to welcome office visitors. Elo @ The Office solutions for corporate collaboration, digital whiteboard, building directory and virtual receptionist are available in North America starting in 30 days. Elo founders pioneered the touchscreen more than 40 years ago. Today, Elo Touch Solutions is a global supplier of touch-enabled technology, products and industry solutions. The Elo portfolio encompasses the broadest selection of OEM touchscreen components, touchmonitors, and all-in-one touchcomputers for the demanding requirements of diverse markets, including gaming machines, hospitality systems, industrial automation, interactive kiosks, healthcare, office equipment, point of sale terminals, retail displays, and transportation applications. The Elo touch experience has consistently stood for quality, reliability and innovation with over 20 million installations worldwide. For more information on Elo products and services, please call 800-ELO-TOUCH, visit us on the web at www.elotouch.com or direct email inquiries to elosales@elotouch.com. Elo (logo) and Elo Touch Solutions are trademarks of Elo and its affiliates.